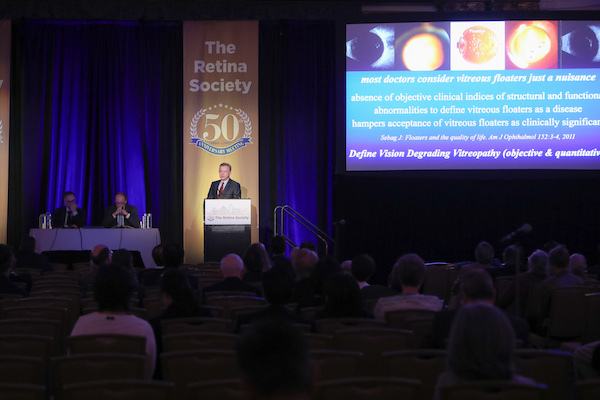 On October 7, 2017 Dr. Sebag lectured to the 50th annual meeting of The Retina Society, founded by his mentor at Harvard, Dr. Charles Schepens. Dr. Charles Schepens, regarded as the “father of modern retinal surgery,” and whose inventions and innovative procedures greatly impacted the ophthalmology field, founded The Retina Society in 1968. What started as meetings of Retina Associates would become a formal two-day meeting, to take place each year, with the purpose of discussing topics related to developments regarding the retina and retina surgery. Dr. Sebag gave a presentation showcasing VMR Institute’s experience diagnosing and curing clinically-significant vitreous (eye) floaters, which can now be referred to as Vision Degrading Vitreopathy. To date, we have operated on 200 eyes with this condition and have had excellent results and very few complications. Dr. Sebag specializes in treatment of diseases of the retina, vitreous, and macula. He has authored three books, as well as many articles, chapters and editorials on diseases, drug therapy, and surgery.